Following my previous posts: “The ten most important issues in…business and plastic pollution/innovation“ and “The 13 most important issues in…business, modern slavery, forced labour and human rights” let’s move on to the topic of sustainable commodities sourcing and landscape approaches to sustainability. So here’s what our research came up with as some of the key issues in this fast-evolving area. As I wrote in a previous post, this research is based on speaking to LOTS of experts, running 16 conferences in this space since 2014, and lots of reading. – How will the landscape approach evolve in the next five years? – What will a sustainable rural community look like in 2030? – What will it take to get the finance sector on board in encouraging sustainable commodities? – Can campaigners and companies ever really collaborate? – Dealing with the inevitable: How can business guarantee food security and help build climate change resilience? – Responsible water usage: What are the practicalities around water risk management and how do they apply to your business? – Can companies now legitimately invest in forest-related carbon credits as offsets? – How can business ensure the sustained viability of smallholders as a business model? – How can business help provide smallholders with the necessary finance and funding that they need? – How can business effectively implement FPIC to deal with land rights conflicts? – Precision agriculture: What are the scalable examples contributing to sustainable landscapes? – How are blockchain and other innovations in technology enabling greater traceability down company supply chains? 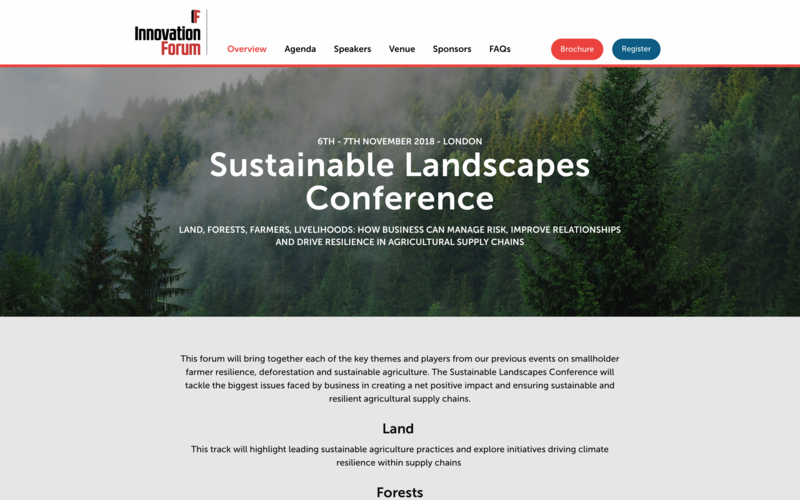 This research forms Innovation Forum’s Sustainable Landscapes business conference, taking place on November 6-7 in London. This is a big conference, all discussion and debate based, where we bring together our events on smallholder agriculture with our series on tackling deforestation. It’s all from the business perspective, but of course taking in the views and experience of other actors.